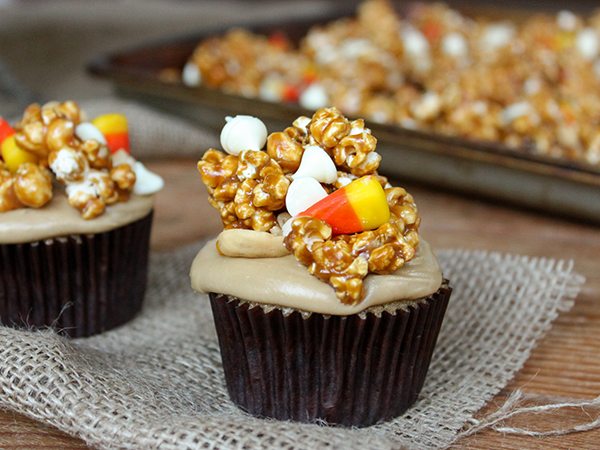 Caramel Corn Cupcakes – caramel cupcakes topped with caramel frosting and caramel popcorn studded with candy corn and cashews. 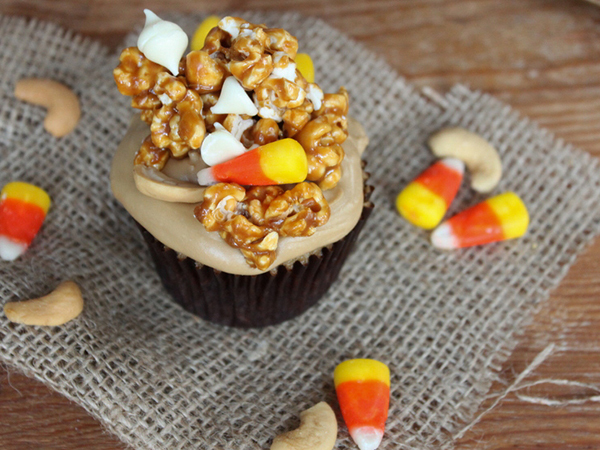 A Halloween cupcake recipe by our contributor, Lauren Kapeluck of EllenJay Events. Happy Fall Y’all! I’m thrilled to be back in full swing with baking and cupcakes after a few months away. 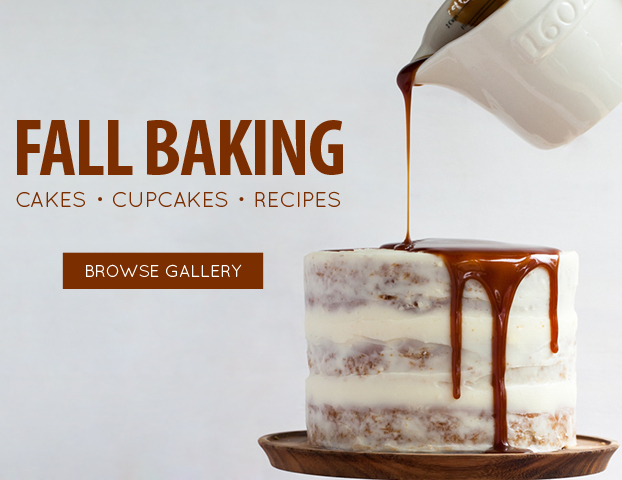 Fall is one of my absolute favorite times to bake so I couldn’t let another month go by without sharing a new recipe with you all! I hope you like CARAMEL because this cupcake is loaded with 3 layers of sugary, buttery, caramel goodness…Caramel Cake + Caramel Frosting + Caramel Corn. Fair warning, this is one sweet creation, but hey isn’t the entire month of October dedicated to indulging in all things sugar and candy anyways! I’ve been envisioning this Caramel Corn Cupcake in my head for a few months now and I’m so happy to finally be able to share it with you all. 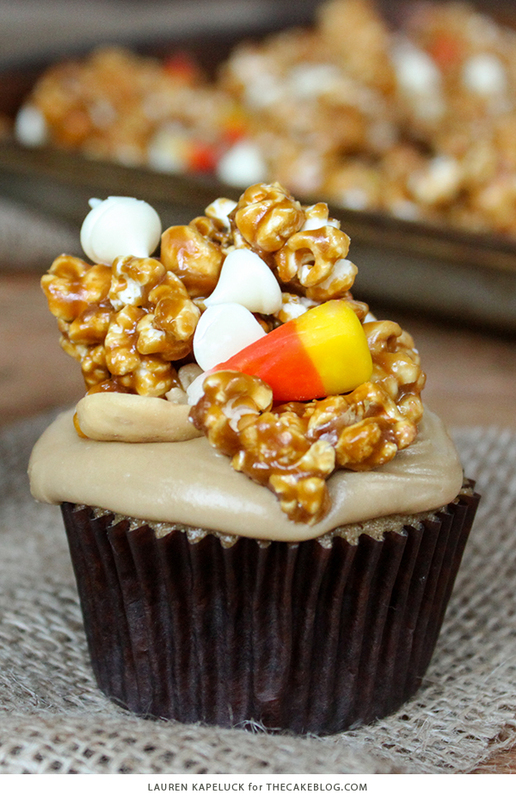 My favorite part about this cupcake is the homemade caramel corn on top! It really makes a festive statement and is pretty scrumptious too! Don’t be overwhelmed by the word “homemade” though, as this really is pretty simple. It all starts with a bag of microwave popcorn and melting a few ingredients on the stove to create a caramel sauce and then placing the popcorn in the oven to bake…easy right? To jazz up the popcorn add in a few of your favorite “mix-ins” for a little extra sweet and salty. I went with candy corn, white chocolate chips and cashews. But really any nuts would be perfect or even chopped up pieces of your favorite candy bars. You can easily make the caramel corn a day or two in advance and store in an airtight container until ready to use, just be sure not to gobble it all up before you’ve made the cupcakes! 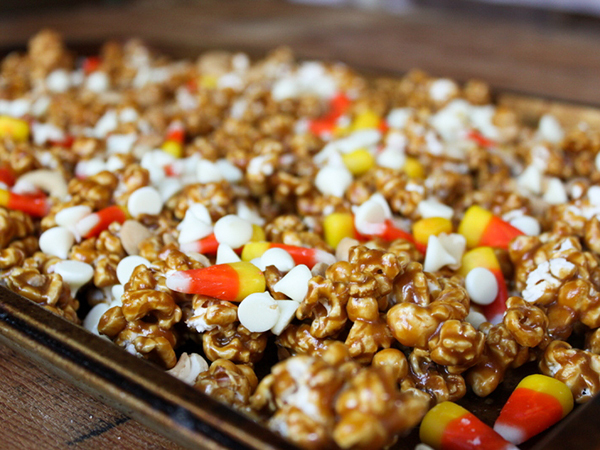 If you’re looking for the perfect fall treat or Halloween sweet this recipe has got you covered! Hope you all enjoy! In a small blow, combine milk and vanilla. Set aside. In bowl of stand mixer beat butter and both sugars on medium speed until light and fluffy. Add in eggs one at a time, beating well after each addition and scraping sides of the bowl. Add flour mixture and milk, alternating, starting and ending with flour and scrape sides of bowl as necessary. Mix until well combined. 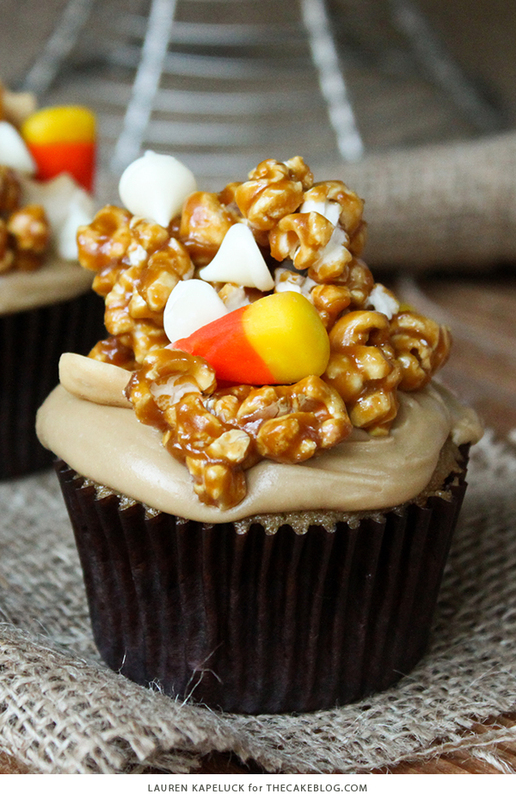 Once cupcakes are completely cool frost with Caramel Frosting and add Caramel Corn on top. Add brown sugar and heavy cream and cook on medium-low until sugar is dissolved, about 2 minutes. Let mixture cool about 10 minutes. Transfer the mixture to bowl of stand mixer. Add confectioners’ sugar 1 cup at a time and beat until smooth. NOTE: I recommend using this icing immediately as it starts to stiffen after about 5 minutes. No worries though, add a splash of heavy cream and stir and your icing will become smooth and easy to spread again. Pop bag of popcorn according to microwave directions. Set aside. In large stock pot, melt butter, brown sugar, corn syrup and salt over medium heat. Let the mixture boil and stir for about 10 minutes until the caramel is bubbling and amber in color. In a small bowl combine the baking soda and vanilla. Remove the pot from the heat and stir in the vanilla and baking soda. The caramel should be light and foamy. Immediately pour the popcorn into the caramel and gently fold with wooden spoon to coat. Pour the popcorn out on baking sheet and spread evenly. Bake the popcorn for 15 minutes. Gently stir and bake again for another 15 minutes. Remove from the oven and stir popcorn one more time. While the popcorn is still hot, add in the candy corn, cashews and white chocolate chips. 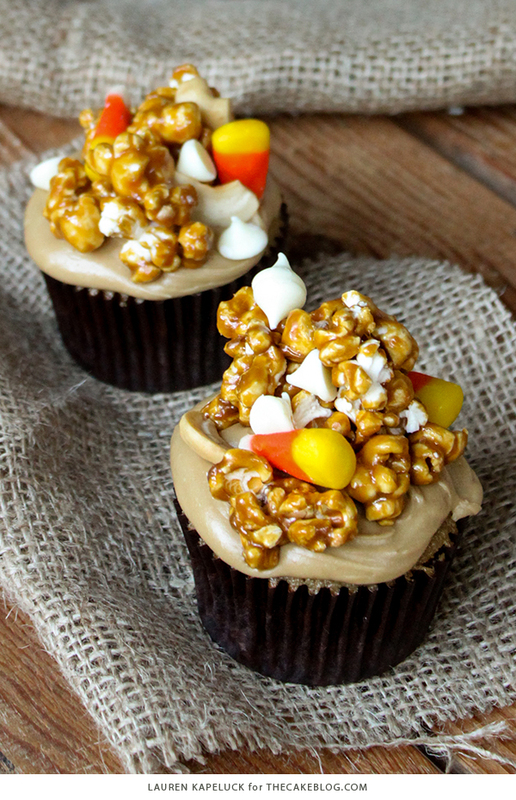 Add caramel corn to cupcakes once cool. Store remaining popcorn in airtight container. I’m going to be making these today and blogging about them. I’m super excited. They look wonderful! Hi! These cupcakes look amazing…I was thinking of trying to make this recipe in full cake form and was wondering if you had any suggestions and what size cake you think it would make…I was thinking it might make a 2 layer, 8 in? Thank you!! Yes, a two layer 8″ cake would work! I need this in my life!! I feel the same – summer really got away from me this year. So far I have only made the topping…. it’s amazing…. but how do you keep the white chips from melting? When I stirred them into the hot mixture they just melted. Still delicious, but not as pretty. Oh, I’m sorry to hear that Audrey. Perhaps sprinkling the white chips on top of the hot mixture once it’s already spread out to cool will allow the chips to stick but not dissolve. I am wondering if this frosting is thick enough to pipe onto cupcakes and hold shape? This type of frosting is better suited for a quick spread with a knife or offset spatula, than for piping. I made the caramel corn last week and it turned out wonderfully. I tried it again today doubling the batch and the caramel corn came out crystallized after I baked it for the first 15 minutes. Any suggestions on what went wrong? I did things the same except doubling the batch, cooking at a little higher temperature, and didn’t stir the caramel as often when cooking. Thanks for the suggestions.